better than i could have imagined: 100 days smarter! 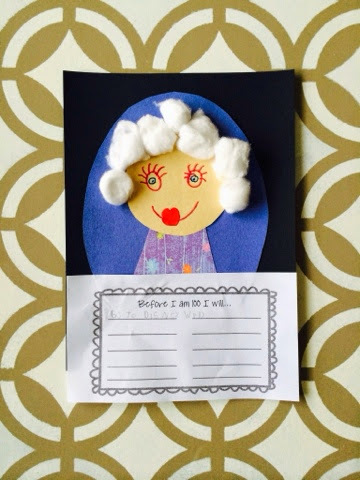 A couple of weeks ago, Parker celebrated her 100th day of Kindergarten. I was able to be there for part of her day and enjoyed getting to see all of the kids in action. 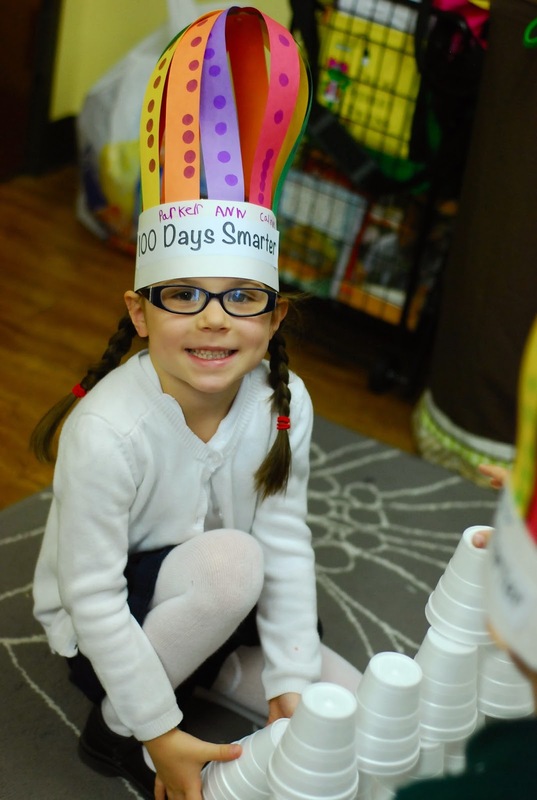 They made these 100 days smarter crowns…10 strips of paper with 10 dots = 100. The students were divided into groups and visited 4 separate centers. Here…they had 100 cups and were challenged to stack them all into one structure. I was impressed with their skills! They used a 100s counting mat and counted out 100 fruit loops and strung them to make a necklace. And their 1-0-0 day snack! 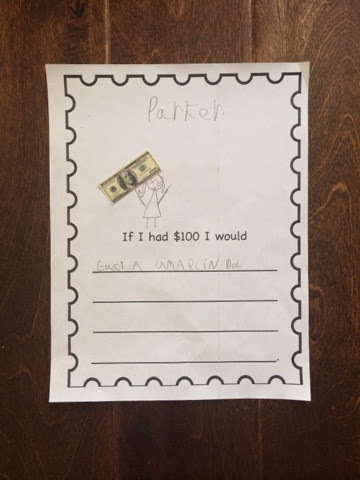 And they also did a "if I had $100" writing prompt which I think turned out so cute. And, of course, the only thing she wanted to buy with her $100 is an American girl doll. Since before Christmas she has wanted one, and so I think we will get her one for her birthday in September. She reminded me just today that she will not forget and does not want me to forget that she really wants one for her birthday. And I hope she loves it because the anticipation will have built up for over 9 months! "American Girl"! Bella would be excited to know about it! She turns 9 tomorrow and still loves all of her American Girl babies and items and goes over the new catalog with a fine tooth comb. Congratulations Parker on your 100 days and may all your wishes come true!